CoeTug Morgan, Daylight’s long serving secretary joined the lodge in 1969 from South Gate Lodge in Burien. He was Master in 1973 and went on to become secretary in 1975 following the popular retiring George Peckham. He served Grand Lodge as Deputy of the Grand Master in District No. 5 in 1980-1982, later as Grand Historian (twice), Grand Orator and as Assistant Grand Secretary Emeritus. He twice received the Grand Master’s award as well as being selected the Grand Lodge Mason of the Year and Secretary of the Year. 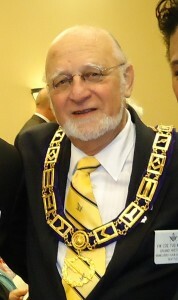 He was chair of the committee that updated to Lodge officers Hand Book in 2010. He became a Mason in South Gate Lodge No. 247 in May 1956. He served two years as Master of Tyee No. 115, the Wayfarer’s Daylight Lodge and five years as secretary of Doric Lodge No. 92 in Fremont. He is the secretary of Oriental (Daylight) Chapter No. 19 Royal Arch Masons and a District Deputy of the Grand High Priest. He is from a Masonic family, some of whom settled in the Burien/Sunnydale area of King County in the late 1870s. Coe Morgan is also active beyond his service to freemasons of Seattle; he has also served as a commissioner on the Washington State Arts Commission and the Washington Territorial Sesquicentennial Commission and as chair of the Sound Transit Citizens Accessibility Advisory Committee.